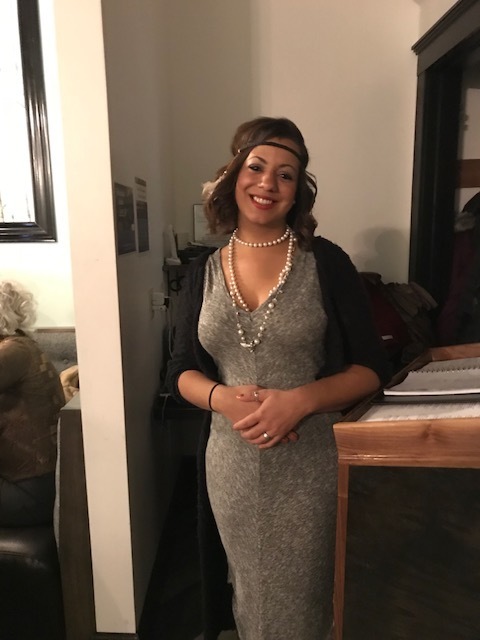 Katie Kowal gets in the flapper spirit during the Prohibition Dinner. Just shy of a little over a year ago I decided I wanted to take another stab at serving and I had just heard of a restaurant about to open called Lark; owned by Richard and Joan Neeno. Lark is a fine dining tapas style restaurant located downtown Janesville, WI and tomorrow (July 25, 2018) we celebrate our one-year anniversary. I remember, vividly, the very first time that I met Richard. I came to Lark dressed to interview; I got there early and stood across the street near the courthouse pavilion nervously chain-smoking cigarettes and sipping cold coffee. I watched painters bring beauty to the exterior of the building. I watched electricians go in and out checking things over. I watched pedestrians stop and show excitement for the new establishment as they walked by. Finally, I went in; that would be so much like me to arrive somewhere early and end up still being late but not this time. I had no idea that I would gain so much more than just a new job. I walked in, stepping over fresh paint and wobbly wood planks, and told a worker that I was here to speak with Richard. The man vanished into the kitchen and out came my new boss. My very first impression of Richard was that he was someone that would be hands-on involved in his business because I noticed he was not wearing a suit and tie. He was wearing khakis and a casual shirt; clothes you could move in and work in. To me, that meant he really meant business. We shook hands, introduced ourselves and went into the kitchen where it was quieter to talk. We covered basic interview guidelines; experience, expectations, requirements and following that he gave me a tour. Even then while it was still under construction the inside had so much charm and potential. The following weeks were filled with training meetings and preparation. I also remember the first time I met Joan; who really is a solid foundation for Lark. I first met her at the first team training meeting. Richard introduced her, just like a gentleman would, and they told us a little about themselves and their lives before building Lark. Joan is a kind, funny and talented person. She does much of the marketing and advertising for Lark while consistently implementing new ideas for improvement such as having live music Thursday evenings and she has a beautiful voice herself. To me, and I’m sure to everyone here, she is the root of beauty who keeps this place blossoming. Richard and Joan complement each other so nicely and I am quite proud to work for them. During my time spent working here I have learned a lot about myself and about the people that work here. No longer strangers but friends who work well together and have each other’s backs. No one here just works for a paycheck, however, that’s a vital benefit. This place offers so much more than that to employees. We get to be creative in preparing food and cocktails which brings passion. Passion is the first thing that I think of when I think of what makes a successful business. We care deeply about giving outstanding service and are always working on ways to improve; individually and as a team. There is even a garden in the back for herbs and some produce (which almost became a playground for my dog on one of our walks, but I stopped him just in time). The fact that this place has expanded my mind and lets me explore new tastes that I was not always open to trying is impressive because I am a stubborn person. All jokes aside, I would like to thank Richard and Joan for sharing Lark with Janesville and for being modest, passionate, and devoted business owners. So, cheers, to many more years of success, happiness and DIVINE food and cocktails because here at Lark, we give boring food the bird. Happy one-year anniversary.